I know I just recently did this post on my go to's from Ikea, yet last week after flipping through the new 2014 Ikea catalog I knew I had to share the new awesomeness they have going on. I personally recommend downloading the catalog app on your iPad if possible...it includes cool videos with ideas and how products are made as well as you save a tree! 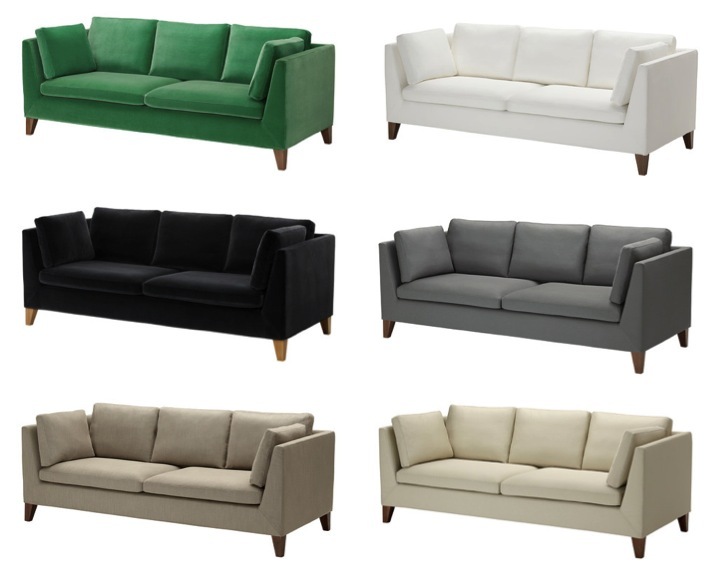 My "OMG I need this NOW" moment was the Stockholm Sofa..in green, and I also love it in white and black. The Soderhamn collection which can be customized to fit pretty much any space... including this chair and corner sofa, as well as various sectional pieces. The white and wood combination of the stockholm sideboard and glass cabinet are great for simple clean lines. This wall shelf can be adjusted to use shelves or bars for storing towels and blankets. This new chandelier could look awesome in so many places!